From time to time I hear the charge that Protestant and Evangelical approaches to salvation are sub-trinitarian. By focusing so narrowly on the question of justification as a legal or forensic action, or Jesus’ cross-work as its grounding, Protestants have ignored the Father and crowded out the Spirit. While I must admit that may be true in some popular presentations, it’s certainly not the case of classic Reformed theology. Not only was God’s justification set within the context of a broader trinitarian theology of union with Christ, the completion of justification considered in itself can only be conceived of as the gracious work of the Triune One. The establishment of the covenant of grace proceeds from God and from him alone. It is he and he alone who for his own sake blots out our transgressions and no longer remembers our sins (Isa. 43:25). We are justified by his grace as a gift (Rom. 3:24; Gal. 3:18; Eph. 2:8; Titus 3:5–7). More specifically, it is the Father from whom this benefit proceeds, for he is the lawgiver and judge (James 4:12), but also the merciful God, who abounds in steadfast love, and blots out transgressions for his name’s sake (Num. 14:18; Pss. 32:2; 103:3; 130:4; Isa. 43:25; Rom. 3:24; 4:6; 8:33; 2 Cor. 5:19). He himself paved a way in Christ to distribute this benefit, so that Christ, too, possessed the power to forgive sins (Matt. 9:2–6; John 5:22, 27), and himself sent the Holy Spirit to apply this benefit to the hearts of his children (John 14:26; Rom. 8:15–16; 1 Cor. 6:11). In the past, Reformed theologians put it as follows: The Father justifies effectively; the Son, meritoriously; the Holy Spirit, applicationally. And to complete the picture at once, let us add: faith apprehends, the sacraments seal, and works declare. Here we see Augustine’s formula “Opera trinitatis ad extra indivisa sunt”, which translates “the works of the Trinity on the outside are indivisible.” In every act of creation and redemption, it is the Father working through, as Ireneaus classically put it, his “two hands” the Son and the Spirit. So then, must a Protestant view of salvation be sub-trinitarian? While we must always keep in view the broad shape of salvation from election all the way through to glorification, even a laser-like focus on the article of justification cannot eradicate the Triune shape of our faith. It is God who justifies us: Father, Son, and Holy Spirit. For those looking to go deeper into the trinitarian shape of our faith, I would again commend Fred Sanders’ excellent little book The Deep Things of God. If you have seem the Son, you have seen the Father and the Spirit. If you have seen the Spirit you have seen the Father and the Son. Etc, etc…. I really enjoyed this, thanks for sharing your thoughts. Indeed it is awesome to see the three Persons of God working specifically in our redemption, in every aspect of it. I’m going through Sanders’ book right now, and I love his thoughts on God as Trinity working in our adoption, and his use of Schaeffer’s work in showing the Trinity as involved in our sanctification. 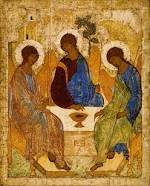 Thanks for pointing to earlier Christians who have presented this, affirming that we have always been trinitarian. Oh, how lovely on the mountains of tradition are the theological thoughts of post-Apostolic reasoning.